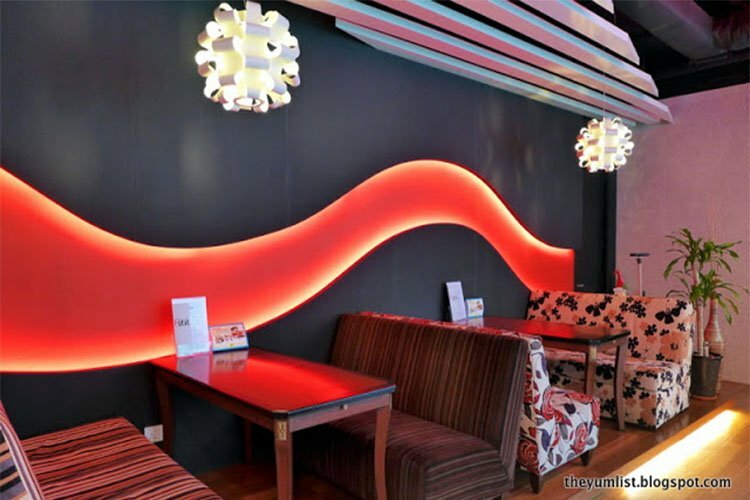 An unlikely venue for top quality gourmet delights but perhaps a more obvious one for healthy and wholesome fare, the Chi Fitness Gym in Bansgar Shopping Centre accommodates this delightful cafe that manages to combine both. Delicious food that embodies clean eating using super food ingredients and avoiding nasty processed foods is what is served up at The Daily Habit. Monica and I paid a visit for our last joint pre-summer hols stint to sample the tasty goodness on offer. 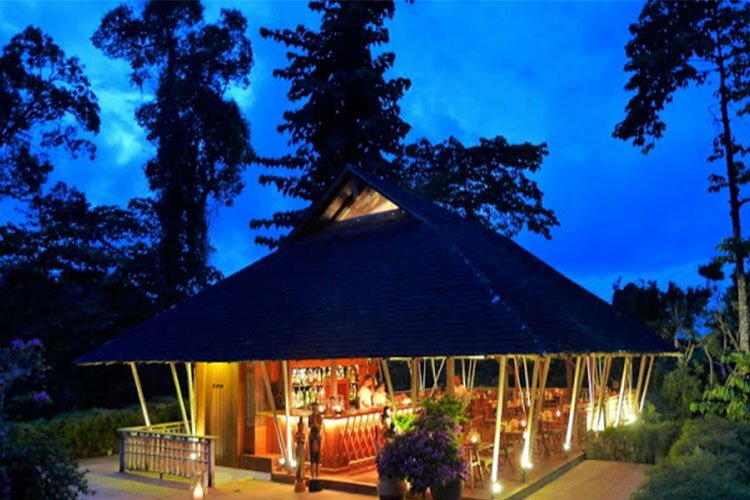 The cafe has a vibrant, contemporary yet cosy ambience and tucked away from the thoroughfares of BSC, this little haven offers a calm space to sit with a book, laptop or even a friend or two to enjoy its wonderful food and drinks with a guilt free conscience. 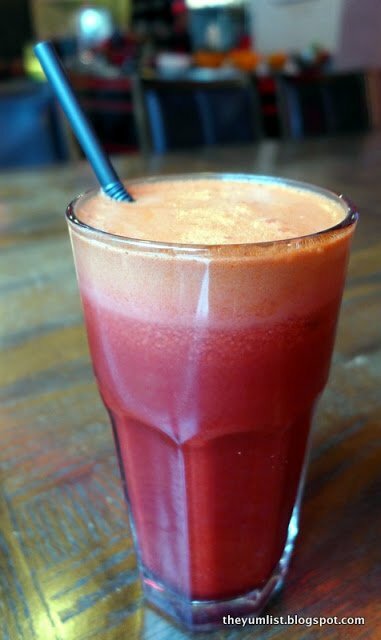 We started the proceedings with a couple of super healthy juices: The cold pressed Clean Red (RM14) was a must for me as it combines my favourites – beetroot, carrot, apple and ginger. I could almost feel this drink lowering my blood pressure and cleansing my system as I sipped. 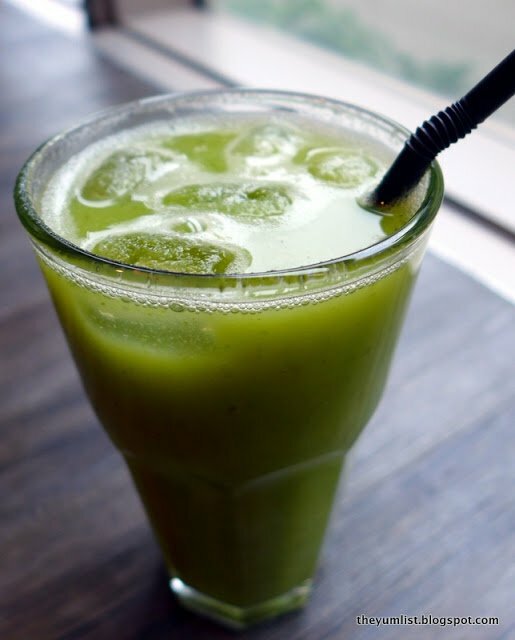 Monica’s choice, the Ambarella (RM14) blends apples and kedondong, also known as hog plum and it was as tangy and refreshing as the vibrant green colour indicates. We began our meal with two offerings from the vegan, gluten and dairy free menu. 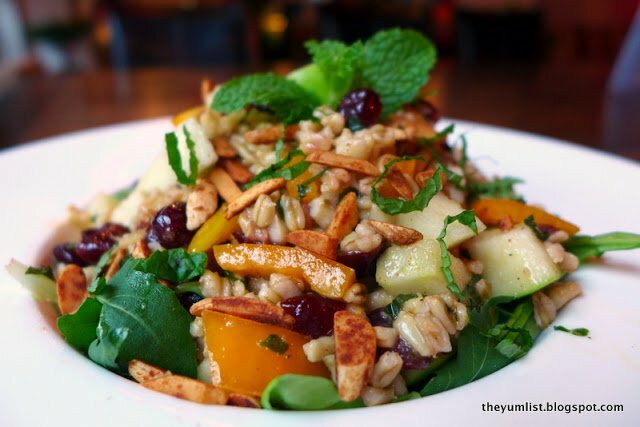 The Cranberries Apple and Almonds Oats Groats Salad (RM26) was bursting with as much flavour as colour. Further enhanced by the orange and mulberry vinaigrette and served on a bed of mixed greens, the flavours were fantastic. 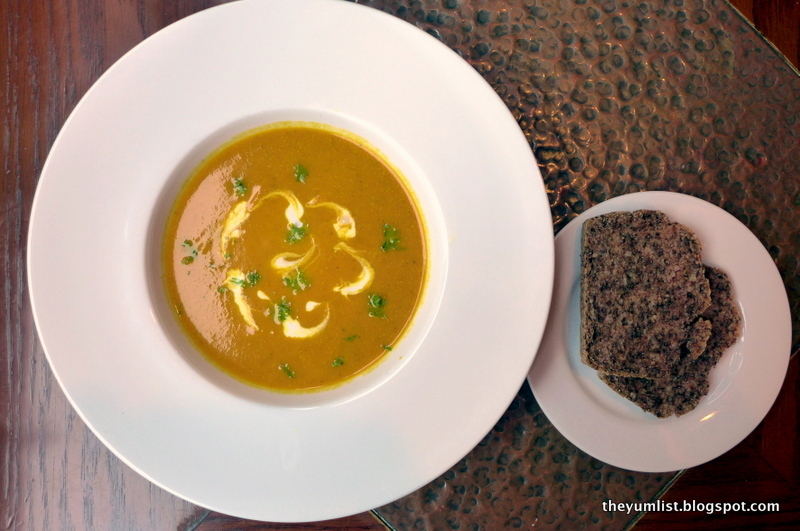 The Pure Carrot, Turmeric and Ginger Soup (RM18) was as comforting in flavour as it was in smooth velvety texture. Drizzled with coconut milk and served with wholesome, homemade Buckwheat and Chia Bread, the combination of its ingredients provided a sweet warmth to the palate. 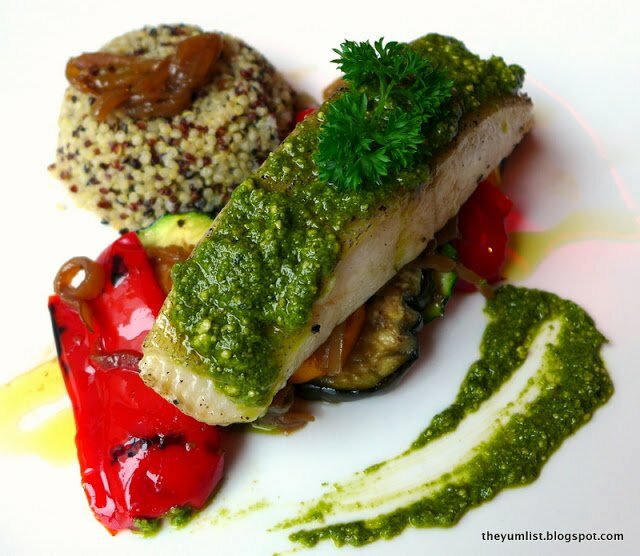 Satisfied by the starters, we moved on to the first our main course dishes, Halibut with Pesto (RM35). The fish was sheer perfection: delicate and glassy inside and beautifully paired with an incredibly rich homemade pesto sauce packed full of basil, pinenuts and Parmesan. 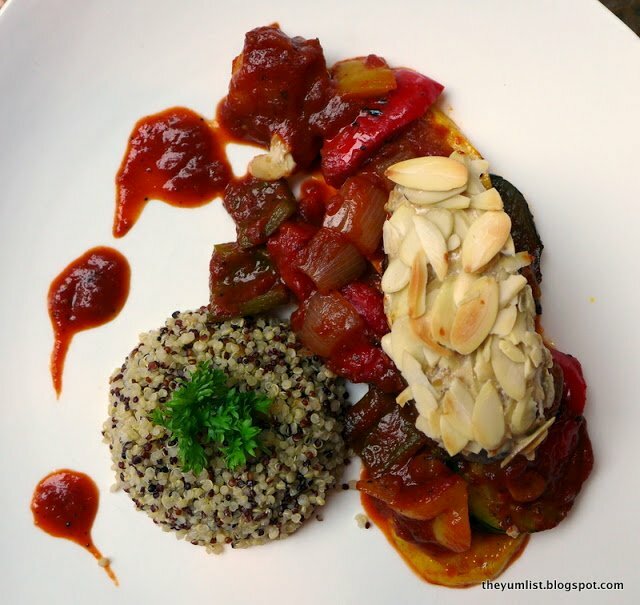 It was served atop a mound of flavoursome grilled zucchini, peppers and caramelised onions and accompanied by a timbale of nutty tri-colour quinoa. 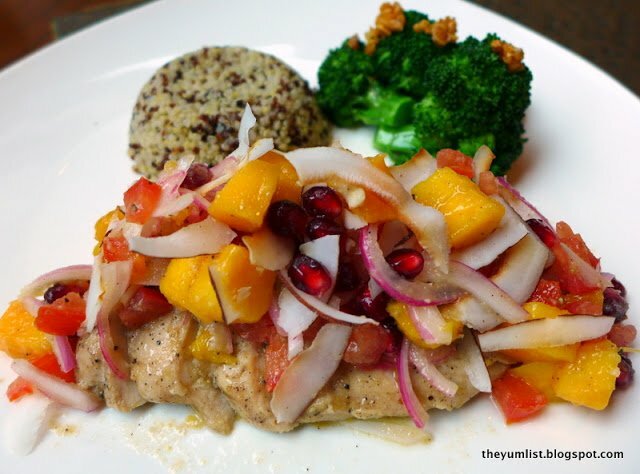 Next before us was the Mango, Coconut and Pomegranate Salsa on Broiled Chicken Breast (RM30) – another big hit with both of us, the chicken meat was tender and succulent and ingeniously complemented by the original flavour combinations created by shards of coconut with the juicy, sweet fruit and sharpness of red onion. Accompanied by broccoli garnished with crispy fried garlic and quinoa, this would make a wonderful lunch or dinner for the very hungry, health conscious. Progressing in richness of flavour, we were next served Kashmiri Lamb With Saffron, Yogurt and Almonds (RM28). 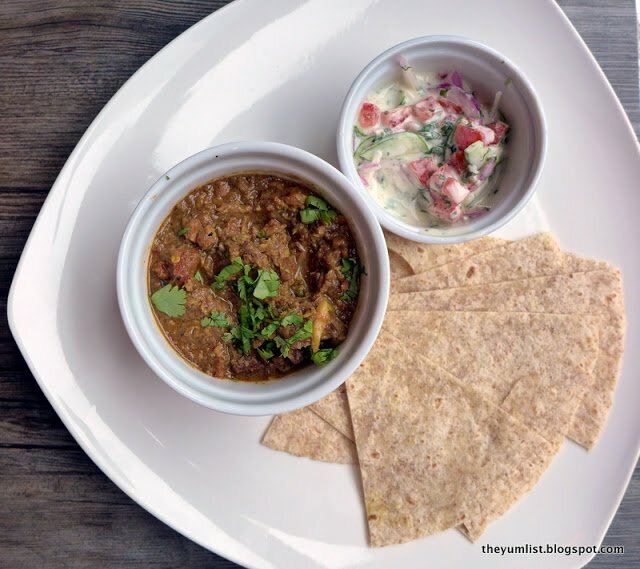 The curry was creamy, subtly spiced and served with a delicious, cooling raita with cucumber, red onion, coriander and tomato. The accompanying triangular slices of soft, wholemeal tortilla were perfect for making little wraps of curry and raita and then for mopping up the remaining stew. No sooner had we polished off the lamb than we were presented with Horseradish and Almonds Crusted Grass Fed Beef Fillet (RM48). The crusted steak was served on a layer of Revised Ratatouille: generous chunks of stewed zucchini, peppers and onion in an intensely flavoursome tomato sauce. Once again, served with a mound of tri-colour quinoa, this was not only very tasty and satisfying but gluten and dairy free to boot. 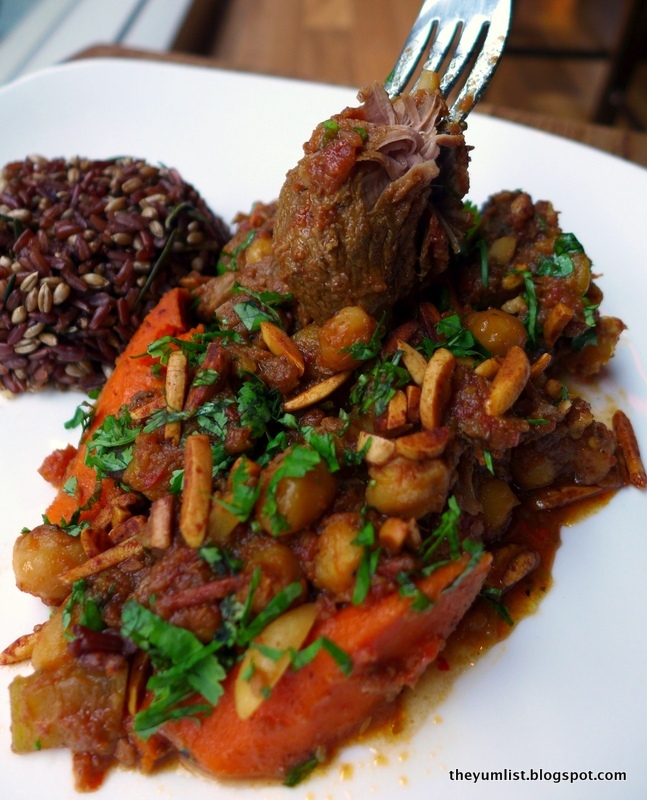 The final of the mains to be served was the Moroccan Lamb Tagine with Apricots and Almonds (RM38). Monica told me that this was Caning’s favourite and that since he’d been unable to join us for the review, she had promised to take some home for him. I now feel compelled to apologise for having left so little but I suspect he will understand that I loved this dish at least as much as he does. The stew was just so delicious, flavoured by the rich tender lamb and the traditional Moroccan spices dominated by the warmth of cinnamon, slow stewed apricots that had been reduced to gooey nuggets infusing the entire dish with delectable sweetness and the chickpeas that added a contrasting texture and seemed to have absorbed all of the intense flavours. Despite the tough competition, this was my favourite dish of the meal. Having completed our meaty marathon, we were ready to end our meal with a little sweetness. Monica’s eyes lit up when told that we were to sample the Mango and Chia Pudding (RM14) but I had no idea what to expect and was slightly dubious. Surely a dessert requires a little naughtiness to tick all of the flavour boxes! I am happy to report that I was completely wrong about this. 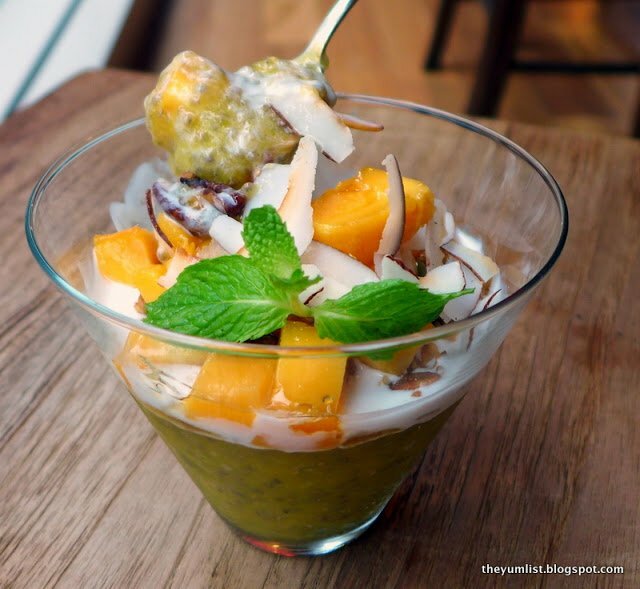 Topped with coconut sago and homemade granola, this was light, fruity, nutty and utterly delicious. 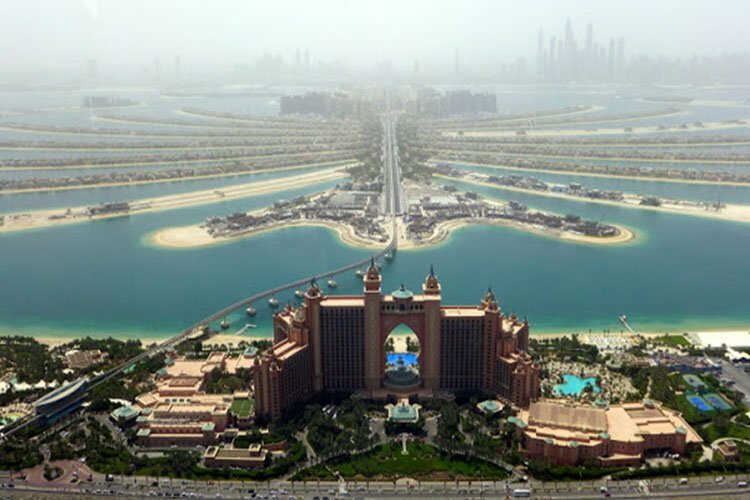 I envisage stopping by for my next fix very soon! Reasons to visit: Delicious food with lots of healthy, vegan, gluten and dairy free options; Cranberries, Apple and Almonds Oats Groats Salad; Mango, Coconut and Pomegranate Salsa on Broiled Chicken Breast; Moroccan Lamb Tagine with Apricots and Almonds; Mango and Chia Pudding. The Daily Habit is open Monday to Saturday from 8:00am to 5:00pm. My God – you two and T.O.H sure can eat. No wonder fitness gyms are on the daily agenda. Hog Plum???????? What on earth is this concoction? Beautiful day here (Brisbane) – SO FAR – 11.00 am!!! Yesterday was a bonza day for winter. tables and displaying your skills??? Ole – Viva Espana etc. Now where is my red cape and sword??? El Cordobes – look out, I'm getting better. Nor can I wait – should be fun. Bull Ring of Granada! Quite a prized possession. The dishes look beautiful and unique, not to mention mouthwatering! It's a great combo – tasty, delicious and good for you! This kind of healthy options is just what we need in the malls – looks great! Yes! I'd like to see a few more of these around malls. 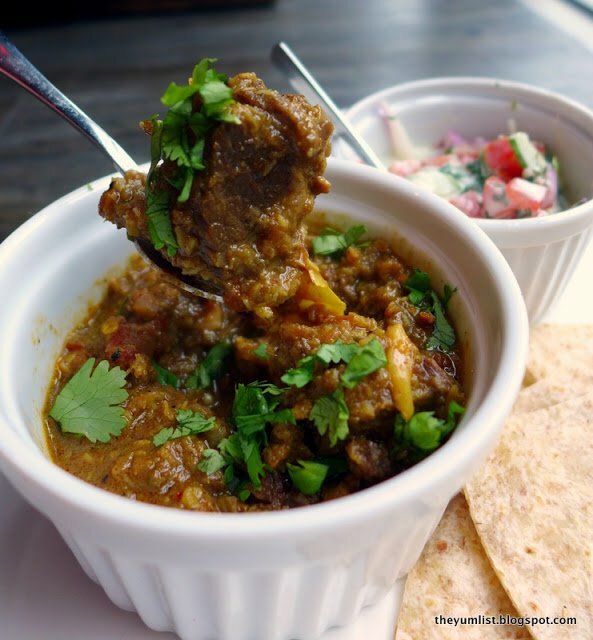 That Kashmiri lamb reminds me of the Bangladeshi lamb curry that we have here – gotta go back there for some now. Drool! Drool! I am sure I'm going to like this. I like the decor. 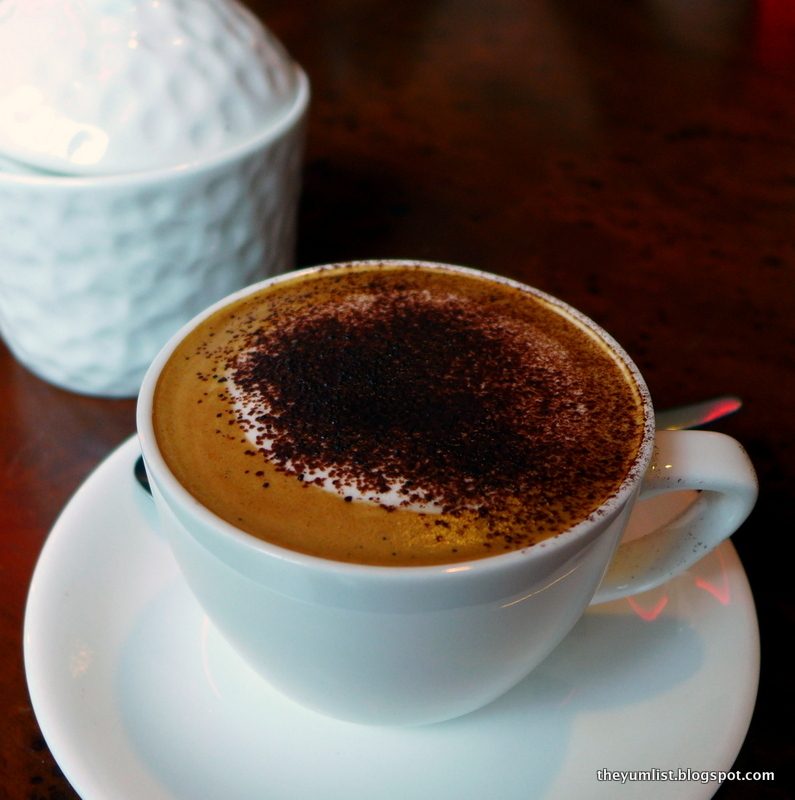 The food and drinks look great…I often wonder do you eat these dishes and drink the drinks you take photographs of! Oh yes, we taste everything! What a wonderful post! The drinks and food all look delicious. It is nice to have more healthy choices. Thanks for sharing, have a happy day! That halibut, and salad…I am HUNGRY! Oh that dish was excellent.